*To get you in the mood for this year's Tevis Cup, this article is the third in a 3-part series on some things Tevis. Part 1, The Tevis Board of Governors: A Year-Round Labor of Love, is here. Part 2, The Wendell Robie Trophy, is here. It's funny, this Tevis Cup Fever. It can grab hold of you before and twist you and turn you in directions you'd never have imagined. What really got it started for Diana Hiiesalu was a magazine cover in the 1980's, of a horse going over Cougar Rock. "I thought, What is this!!!???" Diana related. "I read the article, and was like, What is this ride!? I have to do this! I thought that this ride was made for me, that it was ingrained someway in my very soul, of who I was. It was a given, to ride it." 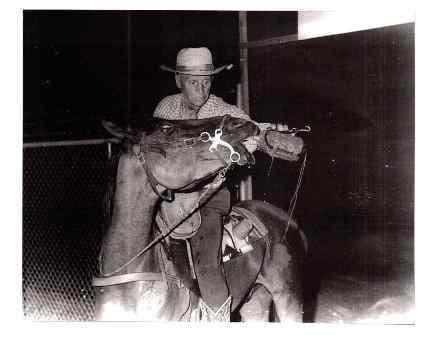 She owned her first Arabian at the time ("who I was kind of terrified of"), and she could picture herself doing Tevis and going over Cougar Rock with him. It didn't work out with that horse, and in fact she went through many horses before she got to her Khemali'i, but he was the one that fulfilled a long-time dream, after 27 years. She and Ali'i finished Tevis twice, in 2011 and 2012. All those years, the Fever burned. "I was such a Tevis groupie. I lived in southern California, and every year I came up here to Auburn, and I sucked it in for the 3 days. "And then once I moved here [to Auburn, in 2009] and I started getting involved with the people that live and breathe this every day - I became really obsessed with it. There's meetings you can go to; there's the Tevis Christmas party; and of course I met Bill [Gore, her boyfriend], and that changed everything for me." Bill was voted onto the Tevis Cup Board of Governors in October, and Diana was at that meeting to support him. This was when retiring long-time BoG member Kate Riordan proposed the Wendell Robie trophy for Tevis horses who have finished the ride 10 or more times. Diana doesn't remember exactly what she heard - sculpture, or bronze - but she immediately raised her hand and said she'd do it for free, if someone paid her expenses and the foundry costs. "Right," Kate Riordan remembers thinking. "Everyone thinks they’re an artist." She didn't know Diana nor her artwork. Art and horses have been a part of Diana's life since her earliest memories. She was drawing and sketching by the time she was 4 years old. "My mom was pretty wonderful for supporting me. She was my biggest cheerleader. Whatever I did, she thought I was wonderful." Her mother supported her love for horses too. Diana has memories of her mom letting her ride the pony riding horses as a little girl, riding around in a circle and wearing a seat belt. That love of art and horses really meshed around age 11 when she read Walter Farley's Black Stallion books and discovered the ink drawings on the inside. "Oh my gosh, they were so beautiful, ink drawings of The Black and his sons. That's probably where I learned to love Arabians." Then, years later, mix in that magazine cover of an Arabian going over Cougar Rock which ultimately resulted in Diana's burgeoning Tevis Cup fever, and you can understand her desire to want to sculpt an art piece for the event she loves so much. With a BFA in Illustration from the Pasadena Art Center College of Design, Diana worked in the commercial art industry even while developing her own art company on the side, Wind Dancing Art, doing watercolor portraits for dog and horse people, and logo designs for ranches and kennels. She's always had a big love for bas relief sculpture, and though she never studied sculpture, she obtained a commission to do all the trophies for the 1997 Collie Club of America Nationals. "I knew what I wanted to do," she said. "I had a vision, and I said I would do it, although I wasn't sure how i was going to do it. I knew that someone would show up and help me. If you have an idea and you have a commitment to something, you have to commit to it and you worry about the details later. I learned that early in life." Help indeed came in the form of a man who happened to see her working on her pieces; he happened to make resin pieces for a museum, and he offered to show her what to do. "He was just a godsend. I don't even remember his name. I spent an entire day with him, wrote down all the notes, and he showed me exactly what to do. I went home and I created all those bas relief resins, and they were beautiful. I ended up doing 22 originals and 220 trophies." 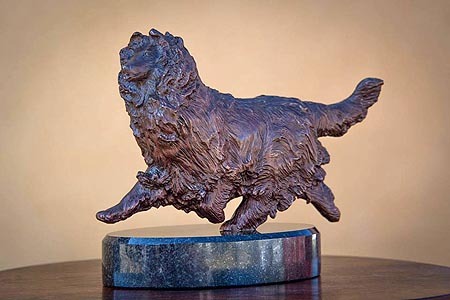 Over the years Diana sculpted a few other pieces, the latest being a bronze of her Collie that she called "Tirzah Gaiting." Flash forward to the October Tevis Board of Governors meeting and the proposal of a trophy, and Diana volunteering to create it. The Board decided on a sculpture based on a Charlie Barieau picture of Wendell Robie at the finish line of the 1961 Tevis Cup, when he finished second on Nugget. (Robie won the first 4 runnings of the Tevis Cup, on Bandos and Molla.) Robie is reaching down to give his horse a drink of water out of his canteen. It was decided the trophy would honor not just the 6 1000-mile horses, but all the 500-mile Tevis horses (there are over 40 of them). BoG member Jeff Herten generously offered to oversee and finance the project. This was a monumental venture not only because of her love for Tevis and art, but Diana knew all critical eyes were going to be on her and her creation. "The biggest thing that kept coming back to me from [Tevis Board of Governors members] Jeff Herten and Kathie Perry and Terryl Reed, was that this guy has got to look like Wendell. "So research for me was hugely important. I learned this when I was in Art Center. If you're going to do art, and it's going to be accurate - meaning not really artsy or abstract - you have to be authentic. You have to know what you're doing, because there's going to be someone out there that will know you're lying, or you don't know what you're talking about." Diana studied numerous old pictures of Wendell Robie and of images pertaining to the sculpture, and from every conceivable angle: a horse showing its teeth; a cowboy shirt, a hand holding something. "It took me a long time to find the kind of saddle he rode in. The tack had to look like what he used. I asked Terryl and Kathie and whoever I could a lot of questions about the bucking rolls on his saddle, and reins he rode with. There's some old-timer out there who will know if he didn't have the right kind of reins. It all had to be authentic." 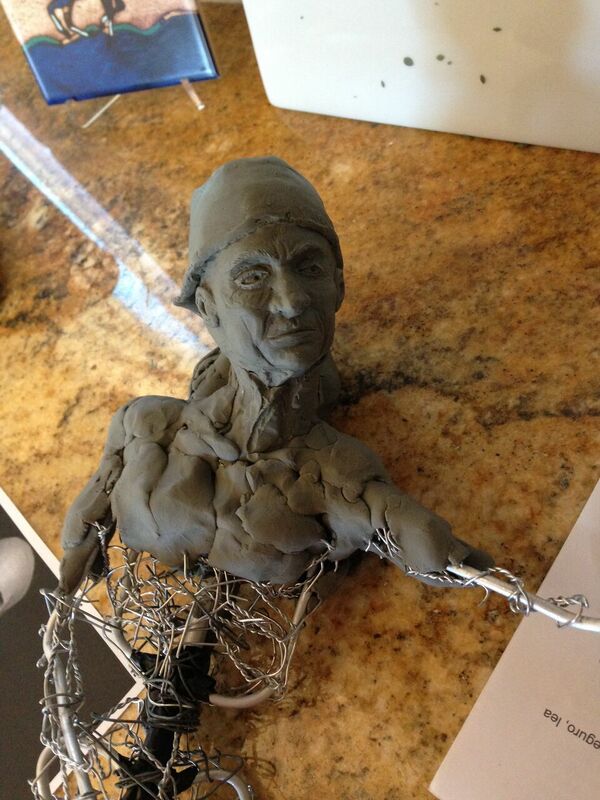 She started on the sculpture on May 1st, creating the basic form with armature wire, then starting to mold the plasticine clay. 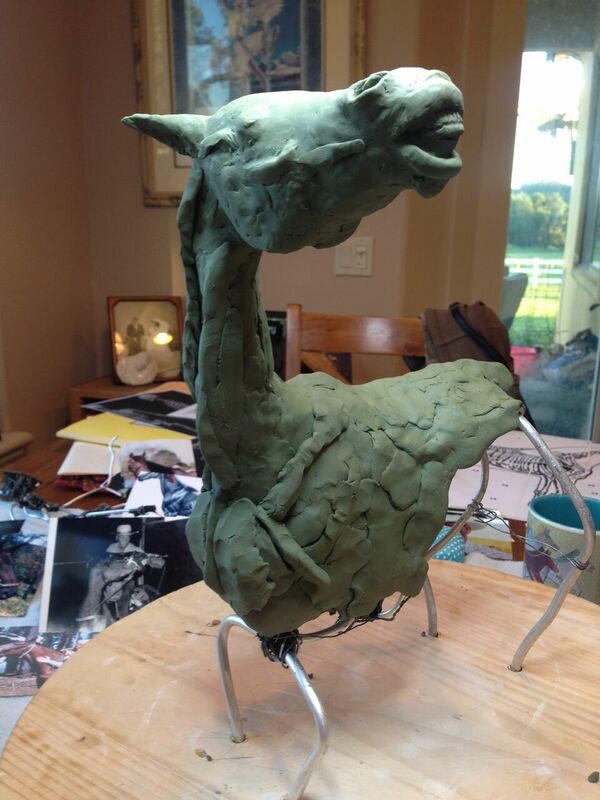 Basic shapes and features came first, and the finer details after: the saddle, blanket, ears, fingers. "It's like building a house. You have to work on the guts of the house before you can work on the extras and outside stuff and pretty stuff." Finally, after working for up to 13 hours a day for almost 4 straight weeks, nearing the finish of her masterpiece, there was a moment of horror. "I moved the whole piece and it almost went flying to the ground - the horse, Wendell, the whole thing. It was pretty terrifying. I would have died; that was the worst part. I was so stressed!" The next most stressful moment was delivering the almost 14" high finished masterpiece to the foundry on May 31st. "I was so worried about driving it down through Sacramento in rush hour traffic. I ended up seat belting it, then turning the air conditioning on, afraid I'd have to stop suddenly and the whole thing was going to come apart." Engraved on the center of the trophy's base will be the names of the 6 horses who have 1000 or more Tevis miles*, surrounded by the 500 or more-mile horses. Diana created a bronze medallion in the likeness of the statue for the horses' owners. 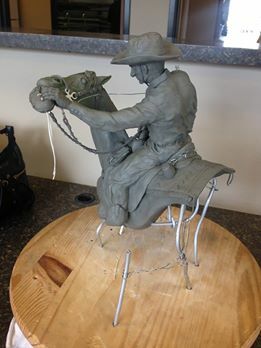 The new trophy will be unveiled at the Sunday awards ceremony following this year's August 5th Tevis Cup. About equal with finishing the Tevis Cup, this art opportunity has been a lifetime dream accomplishment. "Ohmigosh!" Diana said. "For me to be able to do this... I feel so incredibly honored and blessed. Every time I talk to Jeff Herten or anybody about it, I feel like this was a dream come true piece for me to do. "It's probably the greatest thing I've done to date as far as my art career. I am still blown away that they let me do it." Amanda Charlton Herbert, of Summit County, will be traveling to Mongolia Saturday to compete the Mongol Derby which is the longest and toughest horse race in the world. Amanda grew up working and riding horses, in Long Island, New York, she has developed a love and respect for the animals she trains with every day. *To get you in the mood for this year's Tevis Cup, this article is the second in a 3-part series on some things Tevis. Kate Riordan tells this Part 2 in her own words. Part 3 will feature the Wendell Robie Trophy artist and creator, Diana Hiiesalu. I’ve been involved with Tevis since 1968. Long time. Tevis has captured my heart and my sense of discovery, and the people of Tevis have become my tribe. But ever since 1968 one question has banged around in my mind. Why isn’t there a Wendell Robie Cup? After all, he’s the extraordinary man whose vision and determination created the Western States Trail Foundation and the “One-Hundred Mile One-Day Trail Ride” known around the world as the Tevis Cup Ride. In 1991 I was asked to become a member of the WSTF Board of Governors. I was elated beyond measure! After a few years of careful listening and arduous study of what made the members of the board tick and what the overall mission of WSTF was, I presented the idea of honoring Wendell with a sterling Cup much like the Tevis Cup and Haggin Cup. I was voted down. In 2016 I resigned from the board because of my health (Lyme disease that led to a rare neurological disease). But by gosh, I was determined to close my board tenure with a presentation I had prepared. I led with a philosophical statement about always keeping the integrity of this remarkable ride first and foremost, and not letting any kind of “carnival” overture descend upon the ride I so loved. I followed with a few fundraising ideas, and closed with The Big One. The Wendell Robie Cup. I waxed eloquently (at least in my mind, since I’m the Queen of Fluffy Words) about why we needed to honor Wendell above everyone else. He was at the helm of this foundation and ride and without his stalwart determination, there would be no Tevis. I followed on with how I’d like the Wendell Robie Cup to be dedicated to the six 1000 mile horses. I’ve always admired these steeds and what they’ve accomplished, and felt they didn’t get enough adulation. And lucky me, over the years I got to watch all those six horses on the trail. What grit, mindset and soundness these horses had — and all had been ridden by multiple riders to this esteemed accomplishment. So that was it. I pitched the idea of the Wendell Robie Cup, dedicated to the 1000 mile horses, to the board that day in October 2016. It was my last board meeting as a member, so it was my last hurrah. I thought, “Right. Everyone thinks they’re an artist” and instantly ignored the offer by Diana Hiiesalu, who was a guest at the meeting. I didn’t know her nor her artwork. I’m not sure I was even polite to her! Well, I’m thrilled to say that my immediate reaction about Diana couldn't have been more wrong. She is an absolutely amazing artist and her sculptures are incredible. We are so honored to have her create this fantastic bronze. My idea about the Wendell Robie Cup took fire. Board member Jeff Herten offered to oversee the project and decided to include horses that have five or more finishes. The 1000 mile horses will take center stage on the base of the trophy, surrounded on the other three sides by the 500+ mile horses. Diana Hiiesalu was chosen to create the bronze sculpture, and rightfully so. Board member Terryl Reed suggested that the trophy be fashioned after the famous photograph of Wendell still mounted at the finish, giving his horse water from his canteen. And so the Cup became a Trophy. 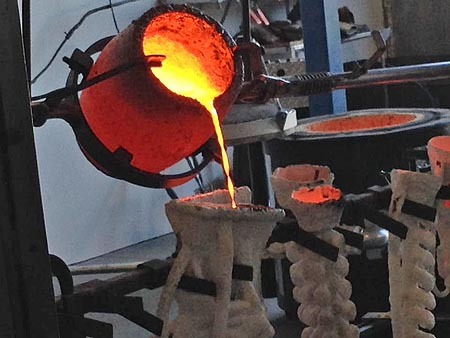 The morphing of clay from a lump into a fabulous reflection of that photograph has magically (with hundreds of hours) emerged into a trophy worthy of the best. I don’t think Diana has slept in months. She deserves our kudos and applause. So the spark of an idea took flame with the help of many. After 48 years of wondering why there wasn’t a Wendell Robie honor, the question can now be laid to rest. HARTSVILLE, S.C. – One thousand kilometers in seven days. That’s what Coker College professor Julia Fisher will shoot for while competing in the Mongol Derby endurance horse race. Starting Aug. 9, Fisher will have 10 days to finish the race, but to be ahead of 35 competitors, she will need to complete the derby in just a week. The race, which recreates Genghis Khan’s ancient horse messenger postal route, takes place in a remote region near the Mongolia capital, Ulaanbaatar. The course takes riders through steppe, desert and mountainous terrain. Riders have from sunup to sundown each day to race the course. They will reach a checkpoint every 25 miles where they will get a new horse and restock supplies such as food and water. If riders can reach a checkpoint by nightfall, they can sleep there. If not, they will be camping out under the stars. The race is featured in the Guinness Book of Records as the world’s longest horse race. Fisher began riding in 2008. A fellow Coker College professor recommended she take riding lessons to relieve stress and fill time after her two children, now adults, moved away. Iola's Ainsley Suskey will travel to Verona, Italy, in September to compete in the 2017 FEI World Endurance Championship for Young Riders and Juniors. Ainsley Suskey is heading to Italy to ride horses. The Iola-Scandinavia High School junior has qualified for the U.S. Equestrian Endurance Team that will compete in Verona, Italy, this September for the 2017 FEI World Endurance Championship for Young Riders and Juniors. Suskey loves the horses she gets to ride. As soon as she was old enough, Suskey wanted to race as well. Tevis Cup fever peaks every summer, but for many people, it's an all-year - or lifetime - obsession. 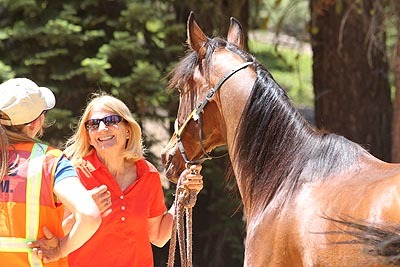 Riders, crews, volunteers, and Board of Governors members all look forward to this annual weekend in July or August under the full moon when horses and riders carry out the tradition of following the 100-mile Western States Tevis trail from Lake Tahoe to Auburn, California. The Tevis Cup Board of Governors of the Western States Trail Foundation (WSTF) works tirelessly year round to continue Wendell Robie's tradition of this ride that he started in 1955. "The Tevis Cup 100 Miles One Day Ride represents the Foundation's commitment to the ideals of a pioneering experience along historically significant trails that traverse the scenic wilderness of the Sierra Nevada Mountains from east of Squaw Valley to Auburn," the Teviscup.org website states. "The founders of the Tevis Cup event offered their vision of a majestic riding trail penetrating the wild beauty of mountain peaks and valleys hallowed by the Washoe and Maidu tribes and later crossed by explorers, settlers and gold-seekers. These founders declared that the virtue of such a trail would lie in helping preserve the historic significance of its route and would encourage people to return to a simple life perhaps furthering their appreciation of nature, history and the outdoors through the humane use of horses. Horsemen can trade the hectic world of traffic jammed freeways and skyscrapers for a realm of natural splendor while passing through cathedral-like groves of virgin forests that shelter vast numbers of wildlife. Therein lies the essence of the Tevis Cup Ride and the historic Western States Trail." The name Barbara White is synonymous with Tevis: familiar to many as the person who has the most number of Tevis finishes (34), and of course as the daughter of Julie Suhr (22 finishes) - often called our First Lady of Endurance. The Tevis Cup fever runs high in their family. What you may not know is that Barbara has been on the Tevis Board of Governors for 11 years. And you may not know what that means to Barbara, and you may not understand what being on the BoG means for all the members. It is a labor of love. "It's easy to think that all the WSTF does is put on a 100 mile ride annually. In fact, the mission statement requires a lot of effort for education, veterinary research, and historical research which keep the Board busy all year," Barbara said. "The Western States Trail Foundation is a non-profit corporation. The structure of the Board is committees, each committee headed by a governor who chooses the rest of the committee. Committee people can be on the Board or not. Most Board members serve on several committees. The entire Board meets four times a year and votes on things such as rule or policy changes brought forth by the committees." The very trail itself is a monumental challenge every year, and the last decade has been most testing, with one cancellation due to fires (2008), several other years of fire scares, and, 2 years, including 2017, just the opposite problem - too much snow. 2011 was a nightmare, with a fire delaying the usual summer date, and a shocking 22" of snowfall at Squaw Valley 3 days before the new October date, which caused a last minute scramble and miraculous effort to change the trail to an out-and-back from Auburn. Likewise, a high snowfall in the Sierra over the winter left some of the regular trails impassible this summer. Barbara explained, "The Ride Committee makes most of the decisions for the Ride itself in terms of trail, volunteers, getting the permits, planning the ride week, etc. With 100 unique miles on a point to point course, it's challenging every year. There are many property owners, ranging from the US Government to someone who may own an acre, all of whom must give permission and be insured every year. Mother Nature throws many curve balls, but an incredible Trail Committee, in concert with the Western States Endurance Run, maintains and prepares the trail, working year round with an army of volunteers. "The WSTF has dealt with fire, snow, raging rivers, endangered species, disgruntled property owners, opposition user groups, and other adversity over the years. The commitment and generosity of those for whom the trail and event mean something keep it alive." This year has been one of the most testing in terms of finding a passable trail. "About a month ago, there were four possible routes being considered. The decision to cross the American River at Poverty Bar was made just a few days ago and finalized the route. Too many people to name, both on and off the Board, have been instrumental in getting it all figured out this year, but Ride Director Chuck Stalley and his wife, Pam, deserve a lot of credit for not just throwing up their hands and taking up some other hobby to be passionate about. They epitomize endurance." Despite the year-round work, and the sleepless days and weeks surrounding the 24 hour event itself, it's clearly an obsession for some people. Or, let's just call it what it clearly is: a healthy addiction. Barbara agrees. "It's hard to 'quit Tevis.' Some of the most active volunteers are former governors. After the Ride, those who worked hard sleep for about a week, except for those noble souls who get busy, right after the last finishers, taking down the trail markers. The Board meets in October, and it all starts over again." Put simply, the Tevis Board of Governors never stops, and Tevis is really a year-round event. "I don't think anyone realizes how much the BoG does," Barbara said. "New people are surprised when they join the board, and it is understood that it may take a couple of years for them to find their places. Although the terms are two years, most people stay on for a long time and consider it an honor. It's an interesting cross section of very committed people. "The 'work' doesn't feel like work because of the widespread belief on the BoG that the WSTF and the Ride have value and should endure through time. Doing so gets more complicated and expensive every year. Recognizing that this year is the 62nd Ride proves, I think, the tireless devotion of the BoG over the decades." It is work, but it is enjoyable and rewarding. "It's a fun board because there is very little ego in it - it's about getting a job done well, and drawing more and more people into the unique realm that is the Tevis. "There's an addictive and cultish aspect to it all that makes it hard for many to escape…"
So next time you see a member of the Tevis Board of Governors, introduce yourself, and tell them thank you. Because if you've got the Fever, you might find yourself in their shoes one day. Hannah Pruss of Belle Fourche, S.D., swept the field in the Big Horn 100 endurance ride held last weekend, crossing the finish line in a flat 15 hours, and tacking on the coveted Best Condition award and a first place in the middle weight class. Kathy Arnold of Basin won the Big Horn 50, finishing in 7 hours, 37 minutes; her horse earned the Best Condition award. Hot weather and the rough terrain took their toll on both riders and horses. Of the 18 100-mile riders leaving the gate at 4 a.m., just 15 finished; the 12-field, 50-mile endurance riders faded to seven. Jeannette Tolman, a key component of the Big Horn 100, said the five 50-mile riders who did not complete the course pulled themselves from the ride. “We call it ‘rider option,’” she explained, adding that she used that option herself Saturday. 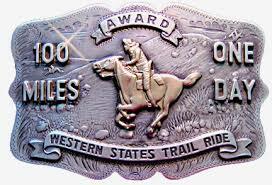 “All the others who did not finish the 50 had no idea what the trail was like; they were used to flat land rides. The ride will start at Soda Springs and travel to Lyon Ridge. Riders will use the Red Star Ridge trail to drop into Duncan Canyon, and ride the Duncan Canyon trail to Robinson Flat. Robinson Flat is the 36-mile point of the ride and from Robinson Flat the trail will follow the traditional route to the finish in Auburn. We will not use Bald Mt., but rather stay on Road 43 to Miller’s Defeat. The River: High water levels at Poverty Bar (3 miles west of Francisco’s and where riders cross the Middle fork of the American River) prevented us from examining the morphology of the river. We wanted to get in the river and verify that the bottom was solid and no troughs or dangers had been carved out from raging waters last winter. We were able to complete that evaluation last Sunday. In addition, we learned that Placer county water agency is now confident that they can hold back river flows on the night of our ride to enable riders to cross with close to normal Tevis ride water depth. We emphasize that the river is NOT CROSSABLE until August 5 as current flows are quite high, rapid, and dangerous. The first six miles of the trail known as the Royal Gorge Ski area are closed as well. We have been granted permission to use the trails for the event and are guests of this area for ONLY THE FEW DAYS LEADING UP TO AND INCLUDING THE RIDE. Duncan Canyon and the trail below Devil’s Thumb are also CLOSED due to major trail obstacles. Some of the high country trails are still wet, and some are on the USFS schedule awaiting yearly maintenance which will be completed in time for the ride. Please follow these trail guidelines, stay safe and happy training. Please plan to bring your own shade to the base camp as we are in gravel parking lots with little or no natural shade. In addition, we may have “big, high country bugs and pests” so bring repellant for you and your horses. Please check the Tevis social media pages as well as our website for trail condition updates as we get closer to the ride. Rider Packets will be emailed to the ride list this weekend. If you don’t receive a packet by Sunday night, please email pstalley@yahoo.com to provide an active email address for us to send your packet. Please print the pages you find useful or necessary. Vehicle passes will be mailed to all riders on Monday, July 24. If you plan to be enroute and not able to receive this mailing at your home address, please contact Jean in the Tevis office ( 530-823-7282) and ask to be put on the “hold” list for vehicle passes. Your envelop will be waiting for you at the Tevis office so you may pick it up when you arrive in Auburn. All foreign rider passes will be held automatically. We wish you safe training, happy horses and good luck. We'll see you at Soda Springs where Tevis magic will happen. Snow – not a report of a mountain lion attack on a horse near the Western States Trail – are causing Tevis Cup officials concern enough to reroute the epic 100-mile ride. With snow lingering in the high country, the Tevis Cup will go ahead as scheduled Aug. 5 but with a different start point at the Royal Gorge parking lot. The ride normally starts at the Robie Equestrian Park, south of Truckee, which is at a higher elevation. The rerouting will help horses, which would have difficulty traveling through snowy terrain, to complete the journey to Auburn, Tevis Cup spokeswoman Jenni Smith said Thursday. Mountain lion dangers for horses and riders along the trail are minimal, given the nature of cougars, Smith said. Hannah Pruss of Piedmont, South Dakota, and her one-eyed horse Stuart won the Big Horn 100 in Wyoming on Saturday, July 15, in a ride time of 15 hours. They also received the Best Condition award. It was Hannah's 5th consecutive Big Horn finish and her 3rd time to win the ride (on 3 different horses). 18 started the 100, with 15 finishing. Carol Federighi and Lily Creek Stetson won the Vermont 100 on Saturday, July 15. Their ride time was 13:08. Finishing second in 13:57 was Bryna Stevenson aboard TEF Lunar Eclipse, one minute ahead of third place Wendy Mancini and Sterling. There were 16 finishers in 21 starters. All 12 starters completed the 75 mile ride, with Meg Sleeper and Syrocco Cadence winning in a ride time of 9:24. Heather Hoyns and Marchesa Garbo finished second in 10:57. There was a 3-way tie for third between Donna Smith Curtin, riding Syrocco Gabriel, Jenn Fisher riding Noble Promise, and Patti Piazo, riding Vallen O Mine, in a ride time of 12:38. Hanna Wightman and Syrocco Rabia won the Vermont 50 in 5:59, more than 40 minutes ahead of the next two, who tied for second place. Sue Greenall, riding Shenanigans, and Douglas Lietzke, riding GE Meniara finished together in a ride time of 6:40.10. 26 out of 32 starters completed the ride. Dr. Mike Peralez is the head veterinarian for the Tevis in 2017. Mike is a rider and rode in NATRC in the 1970s as a junior. I know this because I competed against him then. He also has four Tevis buckles, including one from 1983, when Tevis also started in Soda Springs due to excessive snow. He said riding the alternate route was a wonderful experience. In the article below, Mike shares his experience of riding the Tevis that started in Soda Springs with the riders who will start the 2017 Tevis also in Soda Springs. Mother Nature has a way of messing with the Tevis Cup ride. Recently, we have had fire (2008),snow, subsequent postponement, and more snow (2011), and, of course, this year’s white trail. But how many of you remember the snow of year of 1983? I was lucky enough to have ridden the 1983 Tevis Cup when we started out of Soda Springs in the ski area parking lot. I was young - not yet 20 years old - and anxious about another Tevis start. We all gathered in Squaw Valley on Friday, July 22, 1983 for the usual pre-ride vet checks and socializing (“partying” may have been more accurate, right?). Early the next morning, though, all of us had to load our horses into their trailers and drive almost 25 miles up highways 89 and 80 to Soda Springs. Many of us shared trailer rides to the start to avoid vehicle congestion. It was exciting as all 233 riders lined up for that 5:00 a.m. shotgun start. As many of you may recall, up until that time, the Tevis Cup always had staggered starts with as many as 30 groups. My memories of that fun and exciting mass start are still vivid - as if it were last year. Wild weather pounded the Sierras last winter, and as a result, the 2017 Tevis will start at Soda Springs, California. The last of the snow in the high country (at about 7000 feet) is finally melting. Since we cannot get into the Granite Chief wilderness to assess and repair the trail, an alternate route for the first eight miles of this year’s ride has been locked down. We will camp at the town of Soda Springs one mile off Interstate 80 and just after the intersection of Donner Pass Road and Soda Springs Road next to the beautiful Yuba River. Camping is open from noon Wednesday August 2nd until Saturday the 5th. I recommend you arrive midday Thursday or mid-morning Friday because parking will be tight and shade scarce. Please bring a pop up for mid-day shade if possible. Check in will be from 10 am until 6 pm Friday. Please allow sufficient time to check in at the camp and then walk or ride your horse to the sheep pens in the beautiful Van Norden Meadow to present to the veterinarians for vet in at that location starting at 12 noon. The trail this year will proceed about five miles through the Royal Gorge cross country ski area connecting to the Soda Springs Road. From there you will ride to Forest Service Road 51, which will take you up to Lyon Ridge and the Western States Trail. Once on the Western States Trail, you'll head west over Cougar Rock and on to the Red Star vet check. Just out of Red Star, you'll make a left turn onto Forest Service Road 96 for .7 mile then right on the historic Red Star Ridge trail to Duncan Canyon and up into Robinson Flat for the first one hour hold. At this point the time and mileage is almost identical as it would have been with the traditional start in Truckee. The Duncan Canyon trail is technical and, therefore, slower but stunning. From the Robinson Flat vet check, we will follow the traditional trail on to Auburn. If the water level in the American River is too high to cross at Poverty Bar, we have identified alternate trail above Francisco's that will take us across No Hands Bridge and into the Fairgrounds in Auburn. The highest altitude for this route is 7400 feet and will most certainly be clear of the last of the snow. A note about crewing : The drive time from Soda Springs to Robinson Flat is more than an hour faster than the travel time from Robie Park in Truckee and we will be releasing crews from the start at 4:30 am to drive to Robinson Flat to optimize their ability to arrive ahead of their rider(s). The first of many checking stations along the way was Carter, Wyo., about 47 miles from the starting line in Evanston. A rider by the name of Workman reached Carter by 10:30 a.m., followed closely by J.A. Doling riding Little Minnie. The winners of the first lap had averaged about 10.5 miles an hour. Lexington, Ky. – US Equestrian has announced the following combinations that will make up the U.S. team at the 2017 FEI World Endurance Championships for Young Riders and Juniors in Verona, Italy, September 22-24. The U.S. will be led by Chef d'Equipe Mark Dial. For more information about contributing to and supporting the 2017 team efforts and competition, contact Kristen Brett, director of endurance, at kbrett@usef.org.